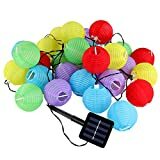 Add a touch of colour with this environmentally friendly solar string light chain with 5 different coloured lanterns. 10/20/30 lights will create a great atmosphere while you and your guests relax on your balcony. Install these powerful low priced solar cells in your garden and enjoy 6 to 8 hours lighting in the evening and at night. Battery: AA 1.2 V (600 mAh Ni-MH) – included in the delivery. The solar string lantern chain is equipped with IRREPLACEABLE lamps. Do not EVER try to change lamps of this string. Suitable exclusively for outdoor usage.